Hope's Cafe: Pace Salsa Review!! I have probably mentioned on here before how much our family loves salsa. Some members in our family only eat salsa with nacho chips. However, I love eating salsa on all different foods! From eggs (scrambled, fried, etc) to chicken biscuits, I LOVE salsa! And yes, chips and salsa is one of my favorite snacks...if I want a snack in the afternoon, or late at night-I reach for a bag of chips, and salsa. And, the brand of salsa we purchase the most is Pace. You can't beat the great taste, and the variety of salsas available! Pace sent me a box of their salsa and picante sauces for review, and I couldn't wait to try them all! Isn't this a great package to receive in the mail?! So, I started out with the Chunky Salsa; this is the kind we normally get (although in varying degrees of heat-I prefer medium, but other family members wimp out and go with the mild :) This salsa is THE perfect dipping companion with tortilla chips! I was anxious to taste the Black Bean and Roasted Corn, as it sounded delicious. Well, it is! It has almost a smoky flavor to it, and a milder heat level. I wasn't sure I would care for the Pineapple Mango Chipotle salsa, as I am not a big fan of the fruity salsas that seem to be so popular recently. So, I was pleasantly surprised when I tasted this, and found that while there is a fruity taste, there is still a peppery, spicy kick! The Pico De Gallo was a favorite with my sister, who really enjoys spicy foods. It has a yummy taste, and a nice crunch! The Salsa Verde, while it doesn't look as appealing as salsa, tastes every bit as good! This is perfect for topping burritos, tacos, etc. It has a definite kick, with a hint of lime! Last (but certainly not least :) is the Picante Sauce. Our family loves using this in breakfast burritos and nacho cheese sauce, but after browsing the recipes on the Pace website, I am saving this to try in a new recipe. 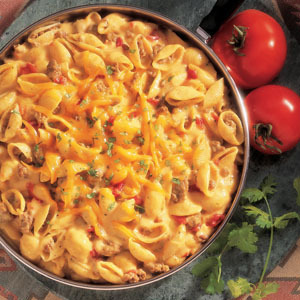 I think this Cheesy Picante Mac and Beef looks perfect! I was happy (but not necessarily surprised-after all, Pace is my favorite salsa brand) to find out several Pace varieties won at the Scovie Awards Competition earlier this month! Yeah! Go Pace!! "January 19, 2011 - PARIS, TX – Pace Picante sauce and salsas scored their highest number of awards ever – nine total wins and two coveted first-place awards – in the National Fiery Foods & Barbecue Show’s 2011 “Scovie” Awards Competition, one of the most competitive and recognized gourmet food award competitions in the country for salsas, hot sauces and barbecue sauces. Named after the Scoville scale, which measures the spicy heat of a chili pepper, all Scovie Award entries are blind taste tested by a panel of judges, who base their scores on appearance, aroma, spice blend, originality, flavor and overall impression. This year’s judges included executive chefs, restaurant owners, culinary instructors, food writers and other food industry leaders. Pace Picante sauce and Chunky salsas swept the “All-Natural” salsa category, for entries made with no additives or preservatives. Pace Picante sauce (“medium” variety) took first place, while Pace Chunky salsa (“hot” variety) won second and the “medium” variety of Pace Chunky salsa took third. Pace Pineapple Mango Chipotle salsa also scored a first-place award, in the “Chipotle” salsa category. The judges also recognized the “hot” variety of Pace Chunky salsa with a second-place award in the highly competitive “Hot” salsa category. Pace Mexican Four Cheese salsa con queso took two second-place awards, in both the “Unique Cheese” and “Prepared Dip” categories. Pace Salsa Verde won third place in the “Tomatillo” salsa category. In the “Unique” salsa category, Pace Black Bean & Roasted Corn salsa took a third place award. The Scovie Awards Competition is now in its 23nd year. Entries are judged by a blind taste-test. In this year’s competition, professional judges evaluated more than 600 entries of sauces, salsas and other spicy treats. The National Fiery Foods & Barbecue Show will be held March 4-6, 2011 in Albuquerque, NM." Disclaimer:I was not monetarily compensated in any way for this post. All thoughts and opinions are mine. All quotes taken from the Pace Foods website. I love salsa! I have tried making it before but have discovered that Pace Salsa is better than my homemade! We will have plenty of this on hand for the Super Bowl game on Sunday!